AED Trainer 2 looks and behaves like the FR2-series defibrillators, but cannot deliver an actual defibrillation shock. It is pre-configured with 10 realistic training scenarios, developed in accordance with internationally recognized emergency responder training programs. 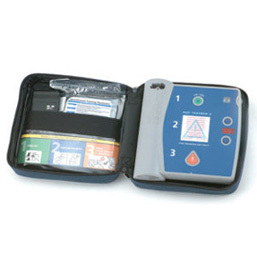 The AED Trainer 2 comes equipped with one set of adult-size reusable training pads, a quick reference instruction card, a user guide, and a carrying case.